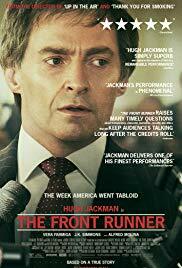 "Oh I'm not really into politics" was a colleague's response when I mentioned how much I enjoyed The Front Runner, and while it would be easy to characterise it as a political drama, that appellation really doesn't do the movie justice. Gary Hart may not be a well-known name in Australia, but in 1988 he was the man to beat in the US Presidential Election before rumours of an affair derailed his campaign. Hugh Jackman does an excellent job portraying Hart as a charismatic and genuinely well-intentioned politician who rails against what he perceives as an invasion of his privacy. The film doesn't limit itself to a simply biographical story, but follows a terrific supporting cast of journalists and campaign staffers at a time when the once-cordial relationship between politics and the media was permanently changing. I would have loved if the movie had more time to dig deeply into the issues it addresses, but it never risks losing your interest and mercifully doesn't fall into the trap of drawing too direct a connection with the current state of affairs in US politics - the movie allows the facts of the matter to speak for themselves.